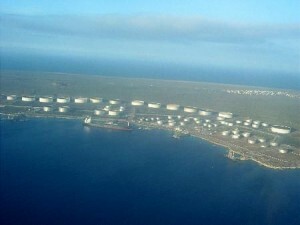 WILLEMSTAD - Venezuela's state-run oil company PDVSA has bought three new cargoes of Angolan and Nigerian crudes for delivery at Bullenbay terminal in Curaçao, according to traders and Thomson Reuters vessel tracking data. PDVSA started buying African crudes in June to use them as diluents for its extra heavy oil and since then it has received some 5 million barrels at Bullenbay, where it operates a storage and blending terminal. The first three cargoes of Nigerian Bonny Light and Bonga crudes, 1 million barrels each, were bought from oil firm Royal Dutch Shell and were discharged from June to July. A new cargo loaded with 1 million barrels of Angolan light crude Cabinda also supplied by Shell was loaded on Aug. 19 and arrived in Curacao on Sept. 5 on taker Arctic, the tracking data shows. Tanker Stena Superior loaded last month with up to 1 million barrels of Angolan Kissanje medium blend and is moored around Bullenbay waiting to unload, according to the data. The provider of this crude has not been identified by tracking systems. The most recent cargo of African crude bought by PDVSA was loaded this week with Nigerian crude on tanker Seavoyager at Bonny Offshore Terminal and it is now on its way to Curacao. This cargo was also sold by Shell, traders detailed. Shell and PDVSA were not immediatly available to comment. Venezuela, with vast oil reserves, started importing light crude last year for first time in its history and since then it has bought Algerian, Nigerian, Russian and Angolan light and medium grades. Most of the oil is being used as diluent to formulate exportable blends. The company is now trying to organize its crude purchases through a public offer that last month received proposals from at least six foreign companies, including Shell, Norway's Statoil, U.S. Chevron, India's Reliance Industries Ltd and Essar Oil and PetroChina Co. Results of this offer are expected for this month. PDVSA is buying spot cargoes in the meantime, traders said.